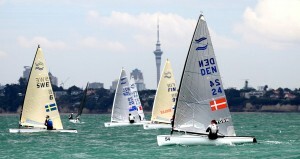 Defending world champion Giles Scott (GBR) has taken the lead at the 2015 Finn Gold Cup after winning the only race sailed on the second day in Takapuna, New Zealand after light winds disrupted proceedings. 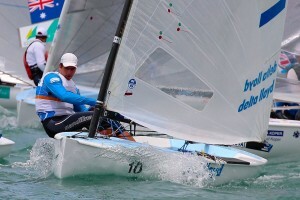 Andrew Murdoch (NZL) drops one to second while Ed Wright (GBR) remains in third. It was a mixed day with several weather changes during the day including some light rain, but the wind also remained light under both black clouds and blue skies. 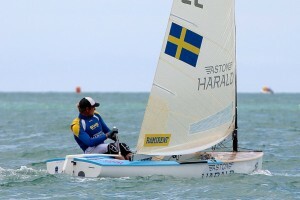 In his first Finn Gold Cup, André Hojen Christiansen (DEN) led round the top mark from the left, with Ioannis Mitakis (GRE), Alican Kaynar (TUR) and Philip Kasüske (GER) close behind. 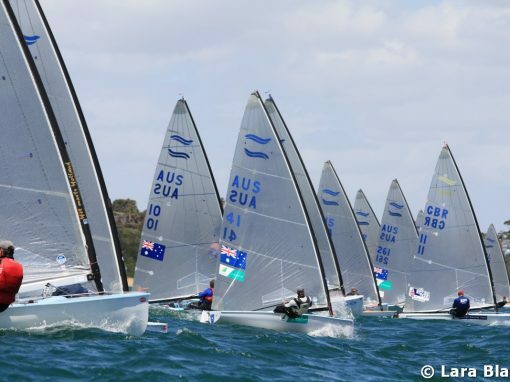 Mitakis took the lead on the first downwind to lead through the gate and extend up the second beat, rounding ahead of Kaynar and a fast approaching Scott. 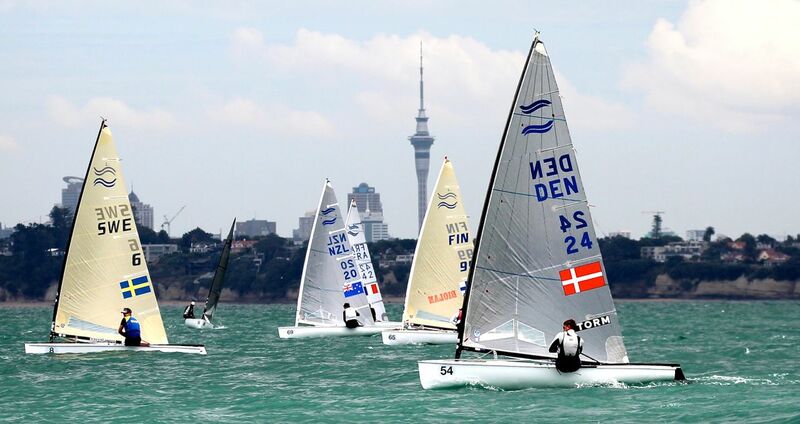 Day 2 at the Finn Gold Cup, with Auckland’s Sky tower in the background. 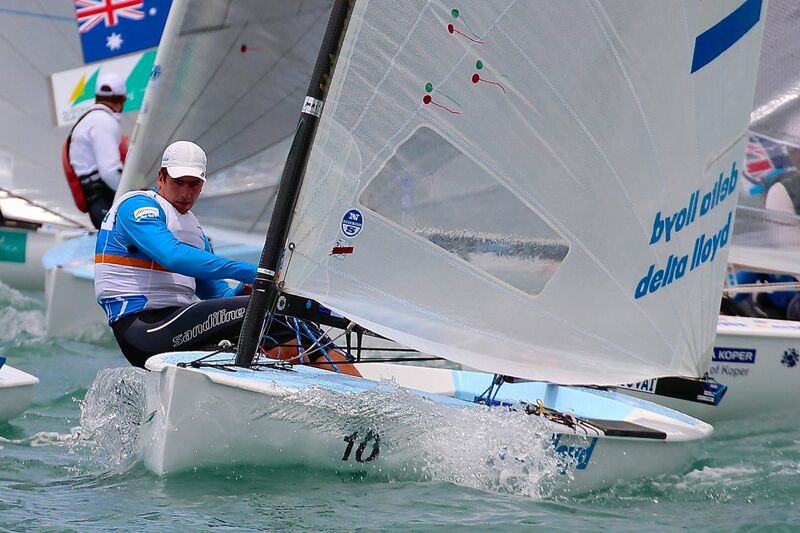 As the wind got lighter on the final downwind, Scott closed up to the left of Mitakis and gained the inside overlap at the final gate to take the lead on the short leg to the finish to win the race. Mitakis crossed in second with Zsombor Berecz (HUN) passing Kaynar for third. The biggest gains went to Pieter-Jan Postma (NED) who had rounded the first top mark around 25th and gained on each leg to cross in fifth, just behind Deniss Karpak (EST). 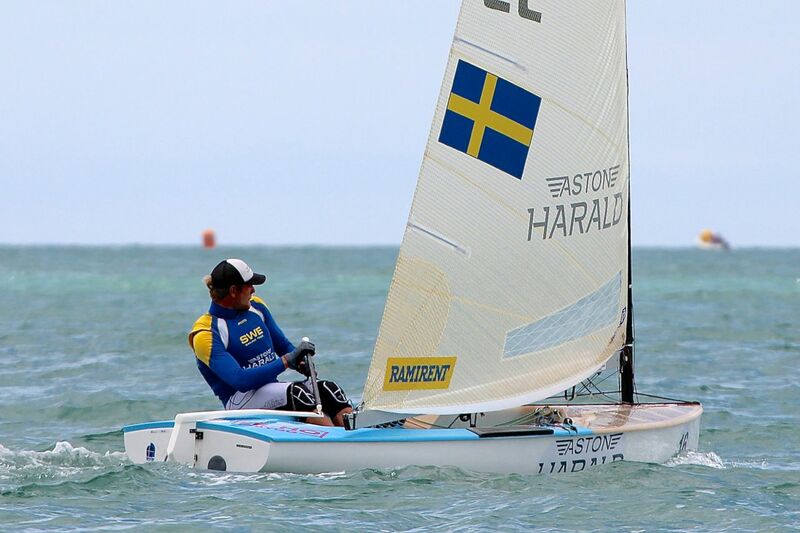 The wind was never particularly strong, topping out at around 8-9 knots, but after the arrival of some dark clouds and rain towards the end of the race, the wind dropped out to 3-5 knots. 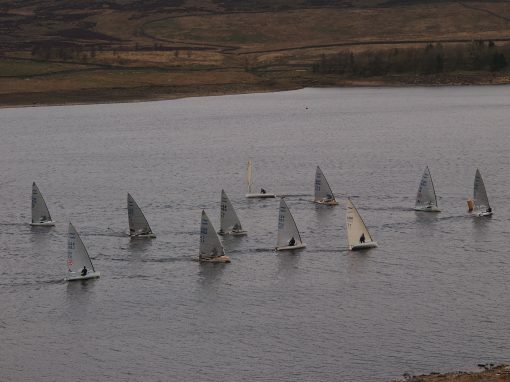 After the finish the fleet waited afloat for conditions to improve enough to be able to start race 4, but an hour later the Race Committee sent the fleet ashore for the day. Many battles are being fought out this week, not just for the World title but also for Olympic selection and for the four precious Olympic places. 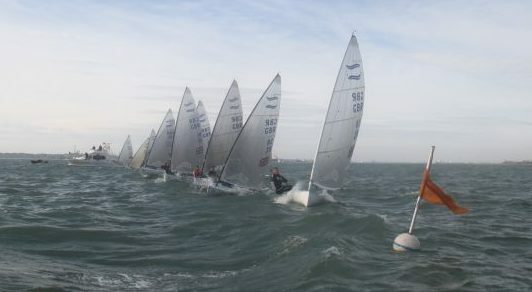 Parkstone Yacht Club’s Ed Wright remains on course to claim yet another Gold Cup podium position with a solid 10th in the highly competitive 76 boat fleet and the ever improving Ben Cornish scored a 24 to remain in contention for the medal race, in 12th spot. 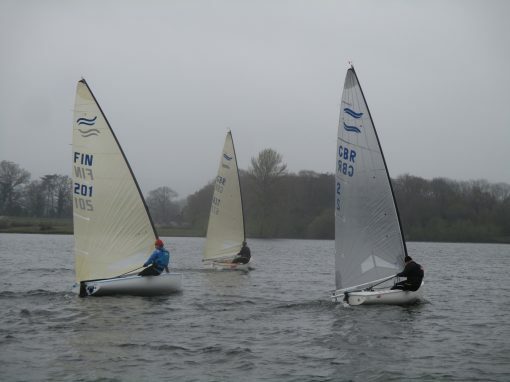 Three races are now scheduled for Thursday to try and catch up with the programme. Video interview with Giles Scott.